Nightmare Before Christmas CollectiblesIn 1993 Disney released Tim Burton’s The Nightmare Before Christmas, the story Jack Skellington, the Pumpkin King of HalloweenTown, who discovers Christmas and immediately wants to celebrate this strange holiday himself. The combination of Tim Burton’s amazing ideas, drawings and characters, direction by Henry Selick, one of the leading stop-motion animators and a fantastic score written by Danny Elfman (also the voice of Jack Skellington) has taken this story and turned it into a cult classic. Pictured right The Nightmare Before Christmas Original Book which has been sold for over $100 and more at auction. Nightmare Before Christmas Collectibles – As with many classics the film was not an immediate sensation – maybe the idea of a skeleton in HalloweenTown (surrounded by vampires, werewolves, mad doctors, ghosts and more) kidnapping Santa Claus did not appeal to some parents? Nightmare Before Christmas CollectiblesNow the thirtysomethings cannot get enough of the film and over ten years later there is a whole industry of merchandise and collectibles relating to the film. Part of this success is down to the Japanese finding the film and producing products after the initial film merchandising had gone. As with Star Wars toys there was not an immediate demand for the original toys and these are the most sort after. 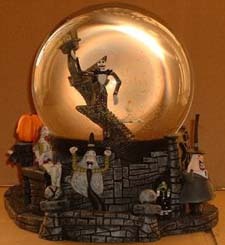 Nightmare Before Christmas CollectiblesToday the collectors is spoiled for choice with many companies producing items ranging from: bags to trading cards, action figures to snowglobes, to high end limited edition figurines and animation art. Pictured right is a 2004 Halloween Snowglobe from NECA featuring Jack and his ghost dog Zero. Nightmare Before Christmas CollectiblesDisney continue to create and market many products, exclusives and Limited Editions. Pictured left is a Jack Skellington Framed Pin Set in a Limited Edition of 1000. Whilst people continue to discover the film and current collectors continue to collect, companies will carry on producing the merchandise. As with many collectibles the early material and small limited editions will continue to be the most sought after.